JusticeCorps is a multiple-award-winning national service program that has helped over one million Californians find access to justice over the past 14 years. Building on this legacy of success, this year more than 300 AmeriCorps members will volunteer as AmeriCorps members to serve people coming to court without an attorneys, who are trying to resolve crucial legal matters affecting their family, housing, personal safety, and financial stability. JusticeCorps members serve in court-based self-help centers in the Bay Area, Los Angeles and San Diego educating litigants on their legal options and potential outcomes. By providing neutral assistance—not legal advice—JusticeCorps members empower litigants to make the best choice for their particular case. JusticeCorps is proud to be one of 255 vital national programs operating in California. Funded by the California Judicial Branch and an AmeriCorps grant through CaliforniaVolunteers. JusticeCorps recruits and trains 300 college students and recent graduates annually to help self-represented litigants navigate the court system. JusticeCorps was launched in Los Angeles in 2004, expanded to the Bay Area in fall 2006, and then to San Diego in fall 2007. Collectively, the program’s regions serve more than 50% of California’s residents, striving toward the Judicial Branch’s goal of access to justice for all. JusticeCorps is a program of the California Courts, administered by CaliforniaVolunteers and sponsored by the Corporation for National and Community Service (CNCS), a federal agency that improves lives, strengthens communities, and fosters civic engagement through service and volunteering. JusticeCorps offers 2 types of AmeriCorps member positions: Minimum-Time (300 hours of service) and Full-Time (1,700 hours of service). Minimum-Time members are enrolled college students who attend JusticeCorps partner campuses in our Los Angeles, Bay Area, and San Diego regions. JusticeCorps “Fellows” (full-time members) are college graduates and are not directly recruited from our partner campuses. Our Los Angeles program also offers a 300-hour JusticeCorps Summer Member option—Los Angeles Summer Members are not required to be enrolled at a partner campus. 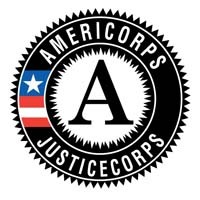 Resources for current and past JusticeCorps members, including how to draw down your education award, training materials and the benefits of being an AmeriCorps alumni. JusticeCorps is a collaborative project of the Judicial Council of California; Bay Area, Los Angeles, and San Diego courts; 8 University of California, California State University campuses, and private and community colleges; and many community-based service providers. CNCS and CaliforniaVolunteers are vital partners to the success of the JusticeCorps program. Learn more about national service nationwide and in California. The Bay Area JusticeCorps program places members in self-help centers in Alameda, Contra Costa, San Francisco, San Mateo, San Jose, and Santa Clara counties. The Los Angeles program places members in 11 different self-help centers around the county. The San Diego program places members in 10 different self-help centers around the county. JusticeCorps staff catches up with a program alum at the AmeriCorps 20th anniversary celebration in the Presidio. Two JusticeCorps alum stop to snap a picture of their name among the 1,700 alumni listed on a commemorative poster at the 10 year anniversary celebration in Los Angeles, CA.